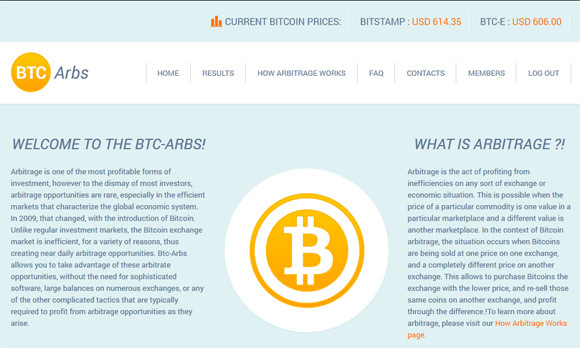 We have been asked by a reader about our opinion and to to check out a website called BTC Arbs that supposedly offers daily returns of invested money or Bitcoins of 0.1% to 10%. What the website claims to do in order to provide so high daily returns on invested money or BTC is arbitrage of Bitcoins between different exchanges. The website seems to be well designed and looks very convincing in terms of information available on it. The minimum investment is $50 or 0.05 Bitcoins and the site accepts direct Bitcoin transfers as well as money deposits from investors with no maximum investment amount. The website even has a Results page a daily return rate on your investment, so everything seems really legit, especially if you do not look into things in detail and are captured by the high profit you are promised. The problem however is that the website is most likely just a scam and another well made Ponzi Scheme that is there to make some quick money at users’ expense! You can see that some people have already tested the BTC Arbs service and report making some money already on top of their investment and withdrawing their earnings successfully. This is a normal way of operation – the first “investors” in a Ponzi Scheme do get paid in order to convince them that everything is working as promised and to encourage them to invest more and more into the service and to bring other people too. In reality however the “earnings” the earlier “investors” are getting do come from money that new users brought to the service are investing into it. And as soon as the authors of the Ponzi Scheme decide to get away with the all the money everything will fall down and some people will actually loose money. But even in this scenario if you are one of the “early investors” and use the service for just a few days with small amount of Bitcoins (never invest real cash into such Ponzi Schemes!!!) you might actually end up making some cash. Never, never and NEVER invest long term in a Ponzi Scheme or HYIP website, but what is even better thing to do is to stay away from such websites! We would not recommend to use services such as this one, even if there is some small chance to actually profit from using them, because this will be at the expense of somebody else just like you! In short – if something looks too good to be true, then it probably is and you should be wise and best avoid it. A high-yield investment program (HYIP) is a type of Ponzi scheme, an investment scam that promises unsustainably high return on investment by paying previous investors with the money invested by new investors. Most of these scams work from anonymous offshore bases which make them hard to track down. Operators generally set up a website offering an “investment program” which promises very high returns, such as 1% per day or even more, disclosing little or no detail about the underlying management, location, or other aspects of how money is to be invested. Or giving you a nice story about the whole thing such as BTC arbitrage, that may sound believable to newbies or people that are generally not very experienced and haven’t suffered yet from such a fraudulent scheme. A Ponzi scheme is a fraudulent investment operation that pays returns to its investors from existing capital or new capital paid by new investors, rather than from profit earned by the individual or organization running the operation. Operators of Ponzi schemes usually entice new investors by offering higher returns than other investments, in the form of short-term returns that are either abnormally high or unusually consistent. The perpetuation of the high returns requires an ever-increasing flow of money from new investors to sustain the scheme. The scheme is named after Charles Ponzi, who became notorious for using the technique in 1920, even though he did not invent the scheme, but his operation took in so much money that it was the first to become known throughout the United States. Ponzi’s original scheme was based on the arbitrage of international reply coupons for postage stamps; however, he soon diverted investors’ money to make payments to earlier investors and himself. The above list contains a few more websites that do rise some concerns as well, though we are not saying that they are all scams for sure, still we recommend to be careful should you decide to try them out. If you still want to try them out do so with the minimum investment amount and do not be in a hurry to invest a lot of coins! Do note that usually if somebody promises you a 2-5-10% or more daily return of investment or even more you should really be careful and that applies not only to crypto currencies.